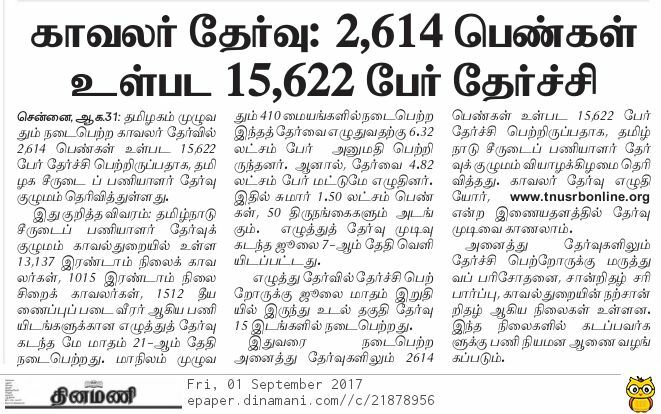 Results for the Tamil Nadu Uniformed Services Recruitment Board (TNUSRB) 2017 examination held for Grade II police constables, jail warders and firemen were declared on Friday. Results can be checked on official website of tnusrb.tn.gov.in and tnusrbonline.org. TNUSRB had conducted the written examination on 21 May 2017. 10 lakh candidates had applied for the examination, of which 5.5 lakh appeared for the exam. The final answer key for the examination can be viewed click here. TNUSRB also released the cut-off list along with the results, which can be viewed on the official website. Candidates who have been selected for the next stage of recruitment can download their call letter from the website by logging in with the Enrolment Number and date of birth from 12 July onwards. Those who haven't been selected can check their marks on the official website from 12 July onward. Step – 2: Click the link 'Results of written examination held on 21.05.2017'. Step – 4: Click on the region center where from you appeared for the examination. You can also download the answer key for your future reference.